Original black cloth binding with gold embossing on spine; 327 pages, with index. 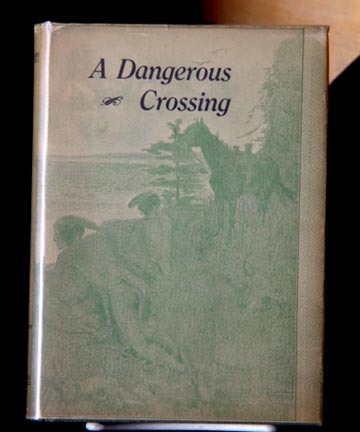 Published by Carson - Harper Co., Denver, Colorado, 1913, first edition, illustrated. Inscribed by Anna T. Steele, wife of Robert. Condition: near fine; tight binding; clean, bright pages. "It would not be possible to trace within reasonable limits of time and space all the minor incidents and movements necessary to a complete understanding of the importance of Judge Steele's career in the Supreme Court ... Enough has been said to indicate that his work there bore a very intimate relation to the great public events of that period, and that in his official opinions he contributed a powerful, and in some measure a decisive influence for the happy settlement of those most serious and most dangerous controversies ...."
STORY OF A PIONEER: An Historical Sketch in which is depicted some of the Struggles and Exciting Incidents Pertaining to the Early Settlement of Colorado. 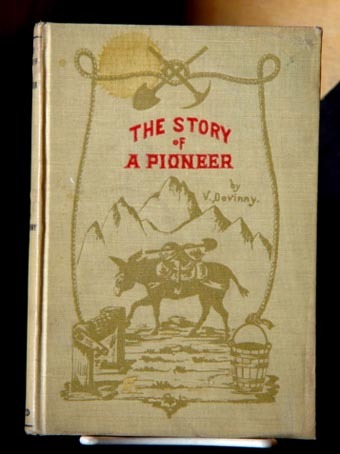 Devinny, V. STORY OF A PIONEER: An Historical Sketch in which is depicted some of the Struggles and Exciting Incidents Pertaining to the Early Settlement of Colorado. Denver, Colorado: The Reed Publishing Company, 1904, first edition. Original illustrated cream cloth covers with red and brown print on front cover and black print on spine; 164 pages; several half-tone illustrations. Introduction by W.F. "Buffalo Bill" Cody with a half-tone photograph of Cody. Frontispiece: half-tone photograph of author. Condition: very good plus; one quarter-sized coffee stain on front cover; indentation of another book impressed into back-cover; pages are bright and clean. An "across-the-plains" account to Colorado in 1860, along with the rigors of pioneer life. A DANGEROUS CROSSING AND WHAT HAPPENED ON THE OTHER SIDE: Seven Lean Years. Hill, Emma Shepard. A DANGEROUS CROSSING AND WHAT HAPPENED ON THE OTHER SIDE: Seven Lean Years. Privately published: Denver, Colorado, 1924, second edition. Press of The Bradford-Robinson Printing Co., Denver, Colorado. First printing was in 1914, and it, too, was privately published. Book is in its original green cloth covers with gold embossing on front; illustrated endpapers; 206 pages; pen-and-ink illustrations; half-tone photograph illustrations of author as frontispiece. Condition: fine in very good plus dust jacket; jacket has some wear along edges and flecks of chipping on toe and head of spine; spine of book is tight and strong. This is a personal account of a journey over the plains in 1863; Indian hostilities; and mining in the Clear Creek District of the Colorado Territory. Shelton, M.B. ROCKY MOUNTAIN ADVENTURES. Christopher Publishing House: Boston, Massachusetts, 1920; first edition. Original green cloth covers with gold embossing on front and spine; 192 pages; half-tone illustration of author as frontispiece. Condition: very good plus; covers clean and bright; front flyleaf has two pinholes, otherwise it is in fresh condition; spine is strong and tight; pages are bright and clean. 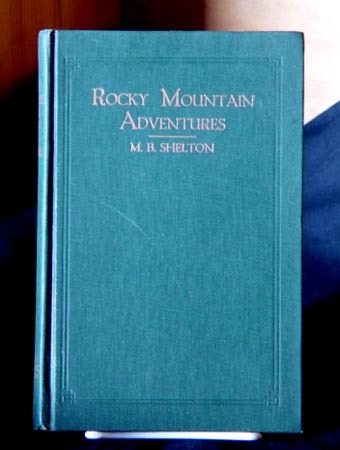 This is the story of Shelton's adventures in Colorado after the end of the Civil War; his travels through the "Great American Desert"; learning to mine in Georgetown, Colorado Territory; work on the Terrible Mine; investment into the King David Mine; possibilities with the Dives Mine; lease on the Summit Mine; work on the Pulaska Mine and in the Shelton Tunnel; discovery of the R.E. Lee Mine and others; and, his prospecting in the San Juan Country and Gunnison County. Submitted by A. Lincoln Fellows; J.B. Hunter; and, C.A. Trease, Cherry Creek Flood Commission. Original black cloth binding with gold print on front cover; 159 pages; two foldout maps; two foldout charts; numerous half-tone photographs. The Smith-Brooks Press: Denver, Colorado, 1913, first edition. "On July 14, 1912, a flood occurred in the Cherry Creek drainage basin within and above the city of Denver, which resulted in great damage to the city and adjacent territory, and again aroused the city officials and the various civic bodies to the necessity of preparing and adopting plans for the control of Cherry Creek floods ...."
Condition: near fine; pages are clean and bright; binding is solid. Published in Work and Win, An Interesting Weekly for Young America. No. 772, New York, September 19, 1913. Original illustrated wrappers; 30 pages, with 2 pages of advertisements. Condition: wrappers are near fine; interior pages browning; uncut pages. Fictional account of hero, Fred Fearnot, and his adventures in Colorado. Published in Work and Win, An Interesting Weekly for Young America. No. 207, New York, November 21, 1902. Original illustrated wrappers; 30 pages, with 2 pages of advertisements. Condition: wrappers are very good with reinforcing to spine; interior pages browning. Fictional account of hero, Fred Fearnot, and his adventures in Colorado. By Max Miller. A Signet Book, published by The New American Library: New York, May 1962, first printing. Original illustrated covers; paperback; 220 pages, plus advertisements; illustrated. This copy was specially rebound by Fred and Jo Mazzulla in red leather with gold print on front cover and spine; plus, a 7-page index inserted before back cover. "The incredible but true story of Colorado's sporting ladies whose easy virtue won them fame and fortune in the most infamous red-light district of the Golden West." Condition: very fine; pages have lightly browned due to the quality paper used in the publishing process; however, spine is tight and pages are bright, clean and fresh. THE A.T. LEWIS & SON DRY GOODS COMPANY, Denver , Colorado . Bound volume of a compilation of “in-house” newsletters for the A.T. Lewis Company and its employees. Newsletters filled with "in-house" news, sales advice, morale boosting, company jokes, information about Company inventory and employee relations. Volume 41144 (intentional misprint? ), Number 1 (Saturday, October 27, 1906) through Volume 1, No. 52 (Saturday, October 19, 1907). Approximately 600 pages. Bound in original green cloth with gold print on spine. Fine condition. THE ROCKY MOUNTAIN GOLD REGIONS , containing sketches of its History, Geography, Botany, Geology, Mineralogy and Gold Mines, and their present operations. With a complete history of the mills for reducing quartz now operating. Illustrated by two maps. By S.W. Burt & E.L. Berthoud, Denver City, J.T. : published by the Rocket Mountain News Printing Co., 1861 -- Reproduced in facsimile from the copy in the Colorado State Historical Society Library, with introductory notes by James G. Hodgson, PH.D., F.L.A., Emeritus Director of Libraries, Colorado State University. Old West Publishing Company, Denver, Colorado, 1962. One of 320 copies, printed by Lawton Company. Book is in its original brown cloth binding with black print on cover and gold-embossing on spine; 144 pages, with facsimiles of original front and back covers bound in. Five facsimile maps and charts in rear pocket. Condition: near fine; no dust jacket, as issued.